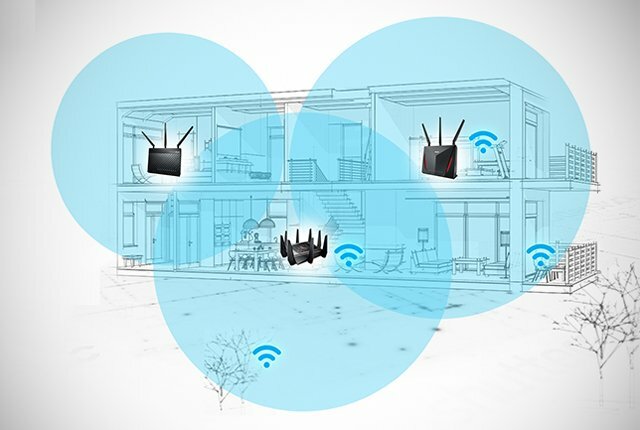 ASUS today announced AiMesh, an innovative feature upgrade for ASUS routers that allows users to easily create a flexible and powerful whole-home Wi-Fi system using any compatible ASUS models. ASUS routers are widely acclaimed for their high performance and outstanding reliability, and with AiMesh users can harness their power to create an unbeatable Wi-Fi system. In actual laboratory tests using the latest dual-band ASUS RT-AC86U router we measured Wi-Fi speeds that were 5.5X faster than a router from a dual-band, tri-hub mesh system. ASUS AiMesh is a free update for selected ASUS routers, and is available worldwide. Currently supported routers are: RT-AC68P, RT-AC68U, RT-AC68UF, RT-AC68W, RT-AC68R, RT-AC68U V2, RT-AC1900, RT-AC1900P, RT-AC86U, RT-AC2900, RT-AC88U, RT-AC3100. ROG Rapture GT-AC5300, RT-AC5300, ASUS Blue Cave and ASUS Lyra Series routers will be ready later in 2018. For updates to this list, please check www.asus.com/AiMesh. Please contact your local ASUS representative for further information.